Hi. My name is Nina. I am married to Bart, and we currently live in Texas with Bella and Taco. Bart sells homes, often to first-time home buyers and I am an editor, writer, and proofreader. I love photography (I use mostly my own photos in my posts), writing, trying new recipes, and spending time outdoors (when it’s not too hot or too cold). I’m also into paper crafts like scrapbooking and card making (although I don’t seem to have much time for it these days). I’m an organized person, but am always looking for better ways to declutter, slim down our belongings, and simplify life in general. I also find joy in offering words of encouragement to others. Bart and I enjoy spending our time off with Bella and Taco. 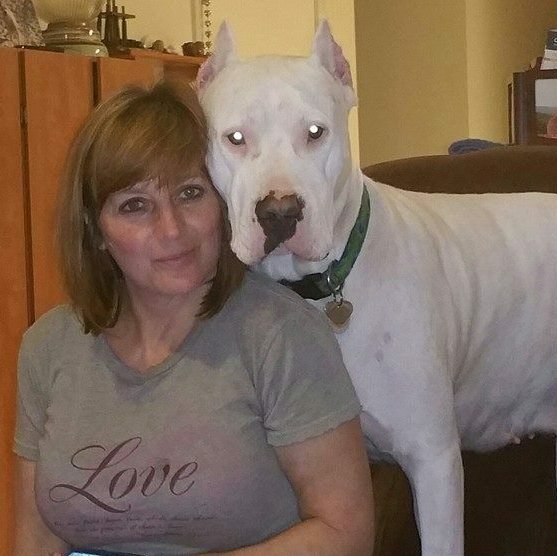 They are Dogo Argentinos; not many people have heard of the breed. They are over-sized compared to breed standards, but they still try to be lap dogs. Taco is one of Bella’s babies. We love watching the two of them play with enthusiasm and then nap together sweetly. We base where we live on making sure they have plenty of room to run around in. Love those babies! I hope you enjoy my photos and my words, and that you always remember to pray big, worry small, and trust God. Nina, thanks for stopping by my blog today and reading my post. I have enjoyed seeing what the Faith Barista has been doing and learning about Finding Spiritual Whitespace. Thanks for being where you were in the linkup today so I’d wander over and be reminded about Bonnie’s wonderful writing.